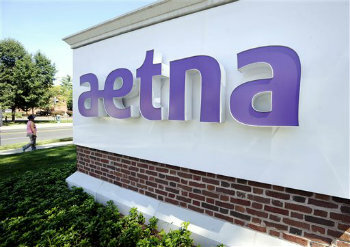 Enrollment in Aetna plans reached 23.6 million in the quarter, an increase of 470,000 members from the second quarter. Aetna will offer coverage in 18 Affordable Care Act exchanges in 2015. Oct. 28 (Bloomberg) — Aetna Inc., the third-largest U.S. health insurer, raised its profit forecast for the year as enrollment increases. Operating earnings this year will be $6.60 to $6.70 a share, above the previous forecast of $6.45 to $6.60, the Hartford, Connecticut-based company said today in a statement. Net income for the third quarter was $594.5 million, or $1.67 a share, up 15 percent from $518.6 million, or $1.38, a year earlier. Profit excluding one-time items was $1.79 a share, beating the $1.58 average of 19 analysts’ estimates compiled by Bloomberg News. Revenue climbed 13 percent to $14.7 billion. Enrollment in Aetna plans reached 23.6 million in the quarter, an increase of 470,000 members from the second quarter. Aetna will offer coverage in 18 Affordable Care Act exchanges in 2015. UnitedHealth Group Inc., the nation’s largest insurer, is expanding to as many as two dozen states. About 7.3 million Americans were enrolled in plans as of mid-August through the exchanges that are a centerpiece of the Patient Protection and Affordable Care Act. The Congressional Budget Office expects about 13 million people to sign up for Affordable Care Act plans next year, more than double the agency’s projections for this year. Penalties for Americans who choose to go without health coverage double in 2015 to as much as 2 percent of their incomes, which may drive increased business for insurers. Another 11 million people will be added in 2015 to Medicaid, the state-federal health program for the poor, from 7 million this year as a result of the law, the Congressional Budget Office said. Aetna rose 0.6 percent to close at $79.18 yesterday in New York. The shares have gained 28 percent in the 12 months through yesterday. With assistance from Alex Wayne in Washington.